I’ve just read the latest book by Sheridan Voysey, an Australian writer, speaker and broadcaster who is now based in the UK. Resurrection Year. is a very open and honest book about the anguish experienced by him and his wife Merryn as they struggled with infertility, and as they began to take positive steps into the future, hopeful that God would give them a period of some emotional and spiritual healing – a resurrection year. Sheridan’s account of their emotional turmoil, and of the spiritual confusion which resulted, is one with which anyone who has experienced suffering – or the long and drawn out death of a cherished dream – can identify. The questions Sheridan and Merryn found themselves asking are the same questions with which suffering believers in God have repeatedly grappled over the centuries. And, as so many others have found, their trust in God has ultimately deepened as a result. Sheridan makes a comment that it is not doubt that is the opposite of faith, but indifference: those who doubt are still grappling with the questions, whereas indifference doesn’t bother. This is a couple who, like Jacob, have held on to God until they have experienced some blessing, even if they still don’t fully understand the mysteries of how God works (and who does?). They have experienced the truth of what Paul famously says in Romans 8:28 – that when ‘God works everything together for the good of those who love him’, the good that is in view is explained in the next sentence: it is ‘to be conformed to the image of his Son’. Sheridan Voysey is a great communicator, and his writing is fresh, vibrant and engaging. 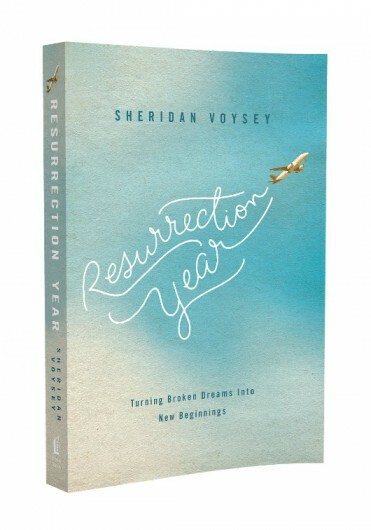 Resurrection Year is an absolute pleasure to read, for its honesty, for its life-affirming, God-oriented hope, and for his vivid, frequently witty descriptions of various stages and events in their life together. If you like a straight-through, beginning-to-end narrative, you may hesitate a little at first as Sheridan interweaves earlier events and journal entries with more recent ones. But the narrative arc of the death of their dream through to the joy of finding themselves with a fresh, unexpected one, is profoundly compelling and inspiring. Couples who have experienced infertility will particularly connect with Sheridan and Merryn’s particular struggle, but anyone who has found themselves at a loss to know what God is doing, or even whether he cares, will find that much to identify with – and be deeply encouraged by.